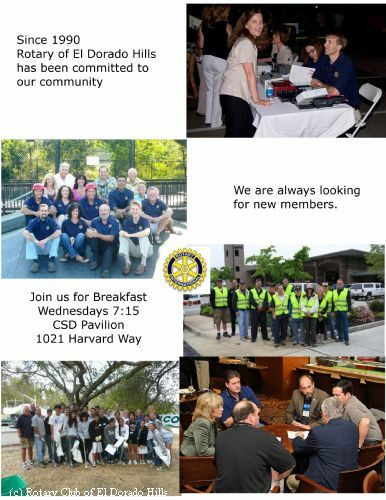 The members of our club will join Rotarians all over the world in a day of community service. Rotarians At Work Day happens the last Saturday in April each year. Started in 2006 as a joint effort between two Rotary Districts (one in the United States and one in Mexico), Rotarians at Work Day continues to grow. Each year, Clubs around the world identify a hands-on project that all members can participate in to help their local community. It's also a great way to meet our members and other supporters of our club, please stop by and say hello. This year we will be raising money for the Salvation Army by holding "Christmas in April" drives at EDH Raleys and Nugget stores. Come by and ring our bells with donations between 10 am & 4 pm! We are also sending a group of skilled workers to assist the Oak Ridge High School Interact Club as they refurbish a house for a family in need. Interested in helping out in efforts like these and many others? Stop by our meetings on Wednesday mornings for more information.